Clicked on retry but the pop-up came up again. 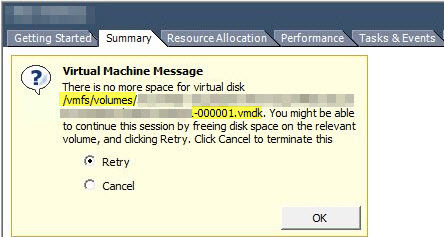 As this popup question suggests, there was not enough space in datastore for the VM to breath and this is because the VM was running on Snapshot (******-000001.vmdk). Even you would see the same question in VM summary page. Here one may ask why this happened, do you not having Storage Cluster/SDRS and the answer is no we don’t (that’s a different story). Thin provisioning is also not the case here but the Snapshot of this large VM is (this VM having one or more TB disk attached). This snapshot was created by VM backup tool during backup but at the same time there was some activity going on the server so it grows unexpectedly, eaten all available datastore space and cause this issue. 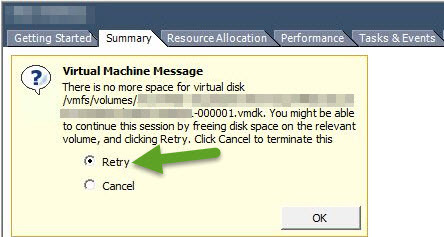 Select Retry option in VM question and click ok.
VM should be accessible now (now you might also take a look at backup server to see if backup was completed, if so but the snapshot is still there then delete the snapshot and if the backup job is still in running state then no worries snapshot would automatically delete once the backup complete). Note: You may also see an open VM console MKS error during open VM console (like /vmx file not accessible or unable to open) due to space crunch in datastore.